Fresh bonito was quickly caught and frozen on board to preserve the freshness. Seared on the surface and sliced for your convienience. Fresh bonito is seared on the surface and sliced. 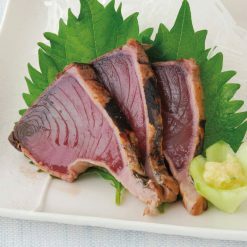 Bonito Tataki (seared bonito) is said to help you heal from fatigue, this is why it is popular to eat it especially during the summer in Japan when the heat will wear you out. In principle, at Sugarlady we use fish that have been captured in uncontaminated sea areas. Sugarlady’s fish and shellfish are processed immediately after harvest, so you can enjoy the fresh-from-the-sea flavor. One of the advantages of frozen seafood is the stable price that is not affected by seasonal changes. Bonito is full of manganese, potassium, vitamin B1 and Vitamin B 6. It is also an excellent source of protein. Bonito is packed with Omega 3 Fatty Acids, which are helpful in maintaining the cardiovascular condition. In fact, it aids in lowering cholesterol and diminishing the effects of blood clotting, keeping a healthy hearth. It also contains folic acid. To defrost, take it out of the outer package and run it under cold water inside the inner package. Once thawed, enjoy with grated ginger or ponzu soy sauce.You can also enjoy it with variety of vegetables such as Japanese basil, green onions or onions. It’s also delicious marinated or used for sushi. You can boost all the health benefits by eating it with grated garlic as well.Other ideas to try are garnishing with orange or lemon slices, or dipping wiht yellow mustard.Since no preparation before cooking is required, they can be used easily and help reduce kitchen waste. This product contains bonito (North Pacific Ocean production). Origin of ingredients: bonito (North Pacific Ocean). 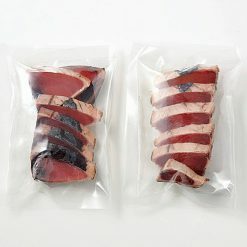 Prepared and packaged in Japan.